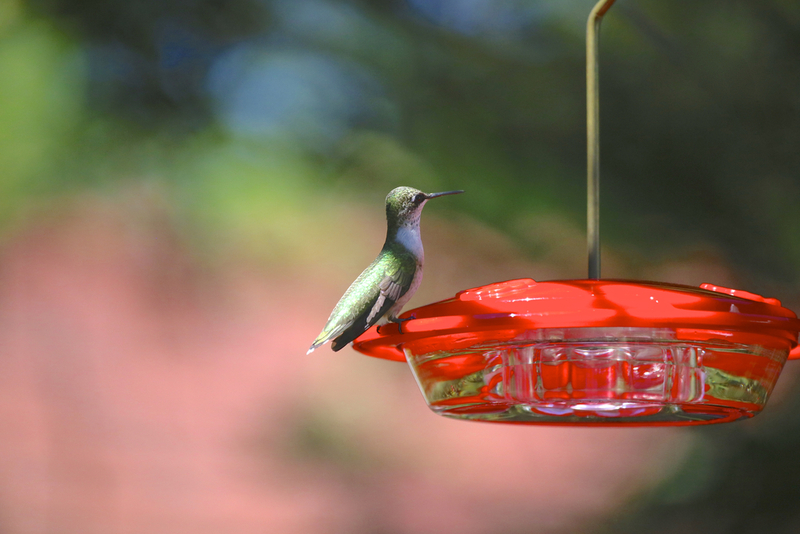 While I enjoy attracting hummingbirds and their visits to our yard, keeping up with feeders can be a chore. If you are considering using them, please keep in mind that the health of the birds must come first. If you find you don't have time to clean them and fill with fresh homemade nectar, I suggest planting many of the flowers I mentioned instead. If you think you will be able to maintain them, then by all means do! The hummingbirds will thank you for it. Perky Pet cinch waist feeder with bee guards and built in ant moat. Birds seem to like it but ant moat doesn't hold much water and therefore needs refilling often. Hard to clean. Walmart 3 port feeder. Does not hold up well to dishwasher, may attract bees. Best-1 Hummingbird Feeder. I find the bottle difficult to clean. Single port feeder. Juveniles love them and they are super easy to clean but they do attract bees which regularly empty them. My favorite - the Hummzinger feeder. Has nicely sized built in ant moat, is somewhat bee proof and is very easy to clean. 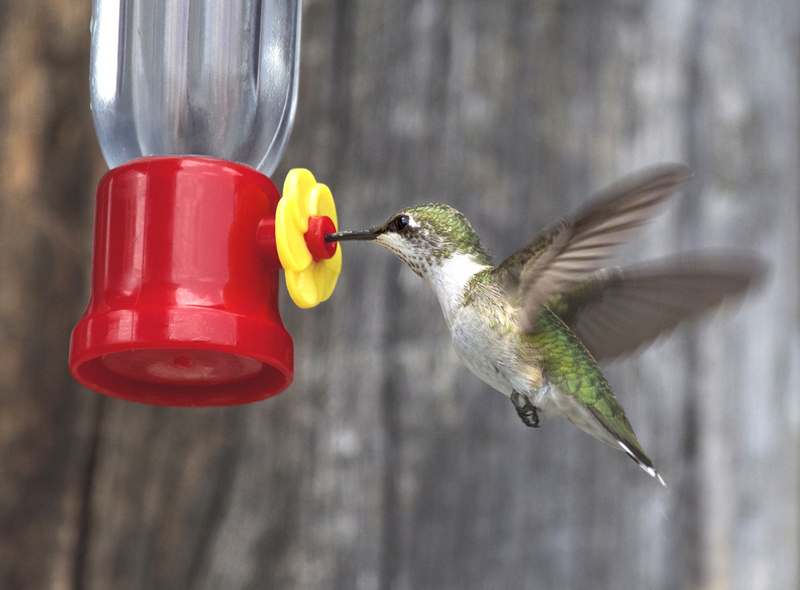 Planting Spring blooming flowers and putting feeders out in April can help attract hummingbirds to your yard while they seek out nectar sources during their northbound migration. It will also provide them with a much needed energy boost. I put out a few feeders in early-mid April and have seen a male as early as April 29th. Males are first to arrive here in spring from their wintering grounds of Mexico and Central America, followed closely by females. In the fall, males are also first to depart, then females, then juveniles. I leave clean feeders up until November for any late southbound stragglers who might need them. Since many juveniles have not mastered the use of feeders, fall blooming flower gardens are must. October 6th is my last recorded fall sighting. 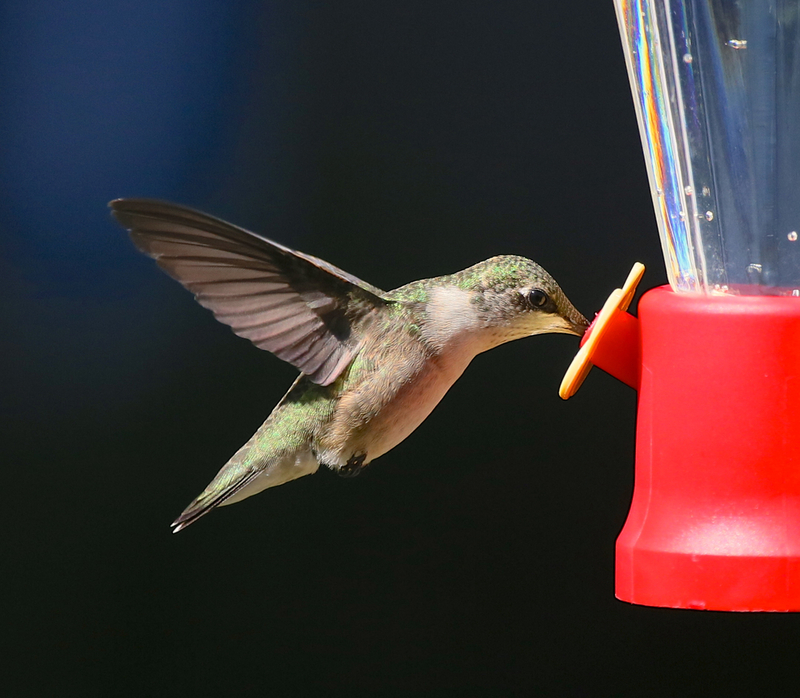 Contrary to some beliefs, leaving a feeder up WILL NOT delay a hummingbird's migration south. Recording sightings in a journal is a great way to monitor activity from year to year. 2015 marked the second year I have recorded sightings and activity. By doing this, I can see that activity has increased. It will be interesting to see what happens in the years ahead. Feeders must be kept very clean and the nectar fresh. You cannot put up a feeder and forget about it. The nectar will get moldy, the feeder will get moldy and the birds will drink from it and they will get sick. If you can't maintain feeders, which means changing out the nectar and cleaning the feeders thoroughly and frequently, please don't put them out. Better to have flowers which will do their job of attracting them without having extra work and worry. If you do decide to dedicate yourself to using feeders, make your own nectar. Store bought nectar mixes have red dyes in them which may be harmful to the hummingbirds, please don't use them. It's much cheaper and easier to make your own nectar solution using 1 part pure cane sugar to 4 parts water. Some recommend a stronger ratio of 1 part sugar to 3 parts water during spring and fall migration. Boil the water, remove from heat, add the correct sugar amount, stir, let cool and fill feeders. Unused portions can be kept in the refrigerator for up to two weeks. I recommend filling feeders only 1/4 full. Long Island does not typically see great numbers of birds (but maybe we can all help change that), so the nectar might go to waste. petroleum products or oils around hummingbird feeders to deter ants or bees. Having multiple feeders around your property increases your chances of seeing them and hummingbirds too. Place feeders in locations you are likely to be able to monitor them for activity. Feeders should be placed in the shade if possible and it is best to place them near recommended flowering plants so the birds spot them. I use a variety of feeders on our property, different birds will have preferences for different feeders. Have extra feeders so you can rotate which makes the job of cleaning and refilling easier. 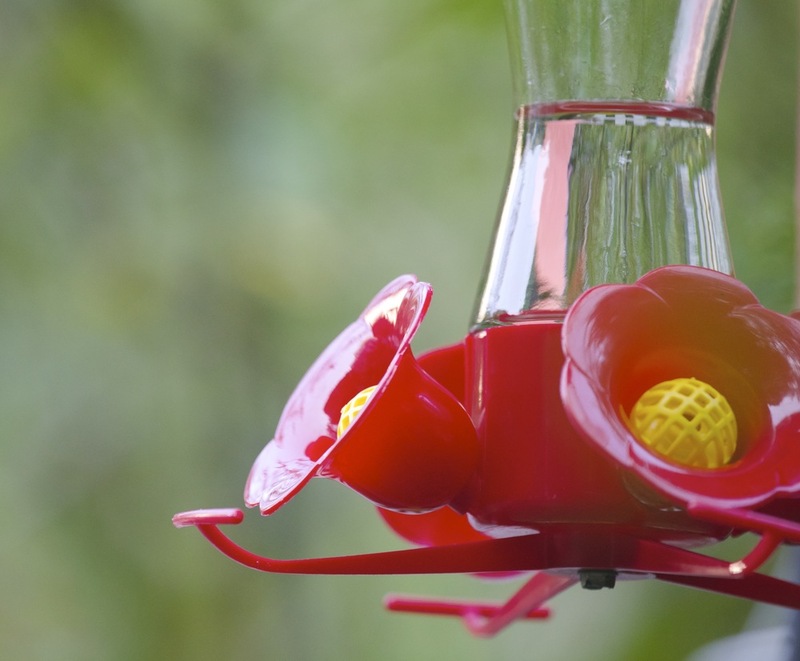 Hummingbirds are attracted to the color red, hence the reason most feeders are red. Tying red ribbons around the feeders can also help catch their attention. Using the color red in garden accents; ie., umbrellas, flags, furniture, cushions, etc., is another trick that is useful. If you experience problems with bees and ants, I advise buying the Hummzinger feeders which have a built in ant moat (to be filled with water only) that deter ants and they have openings which make it hard for bees to get at. Purchasing separate ant moats are another solution, you can make your own or purchase here. Hummingbirds need protein just as much as they need nectar to survive. They get their protein from eating small spiders, gnats, fruit flies, aphids and more. Start a compost pile using vegetable and fruit scraps. Fruit flies will find it and they will provide the protein hummingbirds need. When its decomposed, it will make an excellent, natural fertilizer in the garden. This is just another reason why using pesticides around your home is bad. If there are no bugs, there will be no hummingbirds.